As the metro area grows, finding an affordable luxury studio in Nashville can be harder than parking on Broadway. Located only minutes from downtown, The Melrose has beautiful studio apartments for rent like the Metropolitan floor plan. Our pet friendly studio apartment is 503 square feet with ample space for your furry friends. Our pet policy is a simple one-time deposit with a monthly pet rent. With two pets maximum and no weight limit, there's enough room for the whole family. 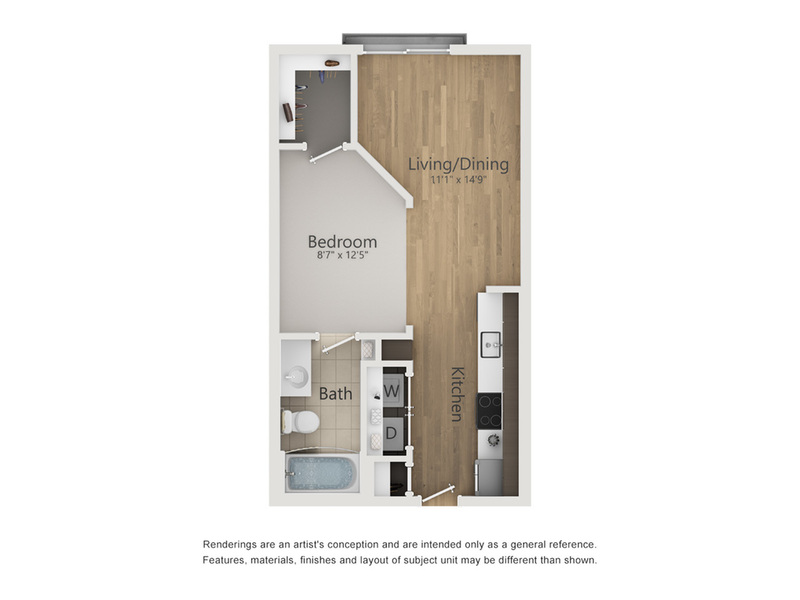 The Metropolitan boasts a simple, yet elegant floor plan with wall to wall stained concrete floors, granite countertops and plenty of storage space. Its carpeted bedroom and closet easily fits a queen sized bed, dresser or night stand and connects to the bathroom. With washer and dryer included, the Metropolitan is a one of a kind luxury studio for Nashville. The Melrose Apartments are located in the heart of Nashville's Berry Hill area. With quick access to the airport, Vanderbilt and downtown, it's the perfect spot for young professionals and newcomers to Nashville. The Melrose is only a few blocks away from awesome restaurants and cafes like Frothy Monkey and Edley's Bar-B-Que, close to shopping and easy access to I-65 and 440 Parkway. As one of the fastest growing cities in the country, Nashville is an exciting place for anyone to live. Call us today to ask about the Metropolitan studio apartment for rent! Learn more about life at The Melrose today! Call us at (615) 696-7448 or email us to reserve your spot in a Metropolitan studio apartment.